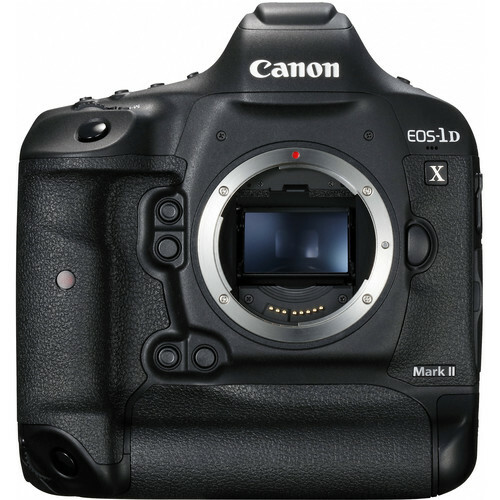 EOS-1D X Mark II DSLR Camera (Body Only) is rated 4.7 out of 5 by 117. Rated 5 out of 5 by Zaccy from In A League Of It's Own First I want to say I am an amateur photography enthusiast and I was gifted this camera for my Birthday. I previously used the wonderful Canon T6s and I must say that although I was a bit intimidated making the switch, the upgrade was painless. I've learned to use this camera very quickly and I could not recommend it enough. If you can afford it, buy it! You won't be sorry. It's got an amazing auto-focus system and really takes advantage of all of Canon's EF lenses. I paired it with two 'L' lenses and I was blown away! I travel frequently and although it is much larger than entry-level DSLRs, I have no problem carrying it everywhere I go. If you're looking for the best, here it is. Rated 5 out of 5 by brusiephoto from Fabulous camera. I love everything about this camera. Almost. Two requests: when set for 4k or 120fps video, can you force the camera to the CFast card? Pulling a card out will reset the camera to the CF slot. Then the 4k is only 1080 on the CF, or it craps out and while the camera is on my Ronin, I am unaware. :-( Provide some warning message OR a menu option to control this. Also, WiFi will be finicky when reconnecting to my iPad (which is dedicated only to the Canon wifi) when the camera gets powered off momentarily for battery change or lens or card... time consuming and annoying on set. The app and wifi should just reconnect, like every other WiFi. Otherwise, a perfect beast. Image quality, both still and video, is astounding. Rated 5 out of 5 by Stewart from Have to get the shots If you are a wedding photographer (which is a lot like sports photography) this camera will nail the focus and get the shots you have to have. Using the focus presets intelligently manages the shoot. It has all the resolution of the former 1Ds3 so you can use it in studio as well. Dynamic range is somewhat improved so shooting between 100-400 ISO will get better quality files. Used with L lenses it will deliver. Used with accessory lenses and less expensive accessories and you are not getting the advantages this camera can deliver. Use it with the new 11-24/4 lens and you will be amazed. Rated 5 out of 5 by P J N from Amazing Prior to my EOS-1D X Mark II, I was using an EOS 6D Mark II with EF 35mm f/1.4L II USM and EF 70-200mm f/2.8L IS II USM. I've been shooting primarily nature, animals, and outdoor sports -- bouldering and rope climbing -- with occasional portraits and group shots. Due to a challenging combination of low light and fast movement, I used to have many missed shots. That wasn't a problem since I take 5000 or so separate exposures per session. Now with the EOS-1D X Mark II, nearly every shot is flawless -- sharp and well-exposed -- and the only challenge is selecting the best of the best. I actually had to buy a new computer to handle the load of RAW processing. I couldn't be happier. Rated 4 out of 5 by JJDrummerX from Needs a little tweaking but overall good so far. I'm a small company (wife and I) and i purchased this mainly for its frame rate in video and the quality the images produce as well. First impressions are that the menus need to be looked at. there is a lag in moving through the different options that neith of my C100's or my 5D3 have. The 4k footage and the 120fps is incredible and the camera was easy to pick up and use right out of the box. Also the cFast port is a DEDICATED 2.0 port. you can NOT use 2 Standard CF Cards. just one of each type. Rated 4 out of 5 by Doug from Fast but same issues as first gen I took thirty shots and, just like its predecessor, the 1DXII splatters all over the sensor. I took 54 nighttime images with a number of long exposures and the last 24 images all had a huge blotch in the image from the splatter. I am disappointed that Canon cannot solve the splatter on the sensor issue. Did one sports shoot of around 2K images and the speed is outstanding. The focus seems much faster than Mark 1 as well. Went out last night to shoot sunset and anything f11 and above is loaded with spots...so sensor now needs cleaning and I've only take 2000+ photos. Have not tried the video yet so will comment after that. Want to test the 'capture a frame' from the 4K. Rated 5 out of 5 by Colin C. from A touch better then Perfect Simply amazing.... Worth every single penny spent. And in my opinion, when in GPS mode, it does not drain battery as much as i was told when i read all the reviews frame rate is uncanny fast!!! If you have used canon already, then the learning curve will be very minimal. every single setting required is available via one hand with one eye in view finder. PERFECT for me!!! Even with my big hands. Very balanced weight, even when you shooting in landscape or portrait position. My only gripe is that i wish it two CFast memory slots rather then one Cfast and an SD. otherwise, if you can get it, then definitely hop on it. For video, how is the Autofocus when not using Canon glass? Sigma Art for example? Canon's Dual Pixel CMOS AF system is designed to work with native Canon lenses. Third party lenses may still work with the system, but it will vary on a lens by lens basis. Are there any cons to shooting with only a CompactFlash card and not a CFast card? For Photos not really... unless your shooting burst mode shooting 14-16 FPS in RAW. The CFast Card will allow you to shoot at that setting for 170 shots per burst which is awesome if you're a sports photographer or want to make other photographers drool at an airshow. For Video... You NEED the CFast card if you plan on shooting anything other than 1080p up to 60fps. The reason I say NEED is because in 4K or 1080 @120 fps the files are ginormous and transferring the files over via Compact Flash takes forever. The other reason is that, in 4K, a compact flash will cut your files up every 15 sec it seems were a CFast 2.0 will just give you one long file. Although you can record 120fps onto Compact Flash cards, you're limited to 10-sec clips. If you require longer clips at that high frame rate, get a CFast. Full disclosure: CFast 2.0 Cards are my LEAST favorite thing to buy, and I feel your pain - so I wouldn't recommend one if it wasn't necessary. You chose the 1DX MKII for a reason - If you want to use this camera to its fullest potential, bite the bullet, wait for a sale, and get at least the 256GB. I made the mistake of only buying the 64GB version and found out during a shoot that only equates to 15 min of 4K footage... so pretty useless. Asked by: JAMES M. H.
Unfortuantely, the Canon EOS-1D X Mark II DSLR camera does not have built-in automatic High Dynamic Range (HDR) capabilities in-camera. However, the camera does have Auto Exposure Bracketing (AEB) capabilities, as indicated on page 243-244 of the camera's instruction manual. The camera brackets the exposure up to 3 stops in 1/3-stop increments for three successive shots. You may use the AEB function to create three images in succession, then use software like Adobe Lightroom Photomatix Pro, Aurora HDR, or Canon's own Digital Photo Professional software (included with the camera) to combine the images to create your own HDR images. Does this record better video? Compare to SONY A7S2 or FS5 or FS7. Thanks. As this camera has not been released yet, this information is not yet available. I would recommend checking user review sites such as DPReview when this information becomes more readily accessible. Why do you have to preorder a 1dx ii from B&amp;H? This item is still new and not yet available from the manufacturer. You can place a preorder for when we begin to receive shipments of this camera, however it is not yet available for regular stock purchases. How many images could be taken with a full battery charge? I have taken 4,296 frames with a fully charged battery with ISO at least 1,600. Shooting was in-doors (sports event) high-speed bursts (14fps) to CFast card. After 4,296 frames, there were 9% battery remaining, at which point I swapped it as I did not want the battery to go dead during the finals. Can I shoot 4k 24fps with just a CF card? At what point will I need a Cfast? If you're shooting video at either 4k 60 fps or 1080 120 fps, you may run into problems, however at 24 fps, you will be okay with a fast CF card. Yes, this camera has an anti aliasing filter.